Our leadership Institutes are designed to support school district administrators, parent and family leaders, and GEAR UP evaluators by providing them with specialized professional development to maximize their leadership skills, technical knowledge, and to facilitate essential best practices. 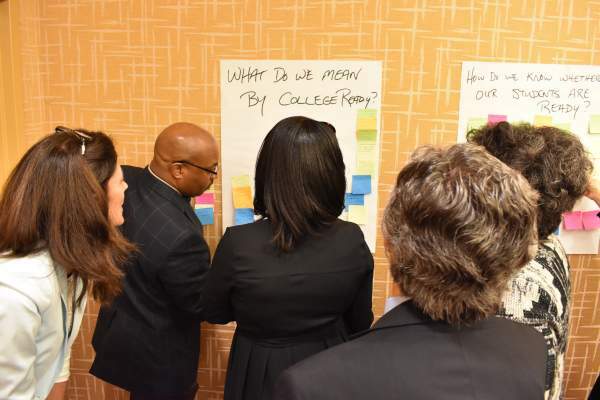 Over the course of ten months, the DLI facilitates a tight-knit learning community of senior-level leaders focused on creating, strengthening and sustaining a college-going culture within GEAR UP school districts. PLI is a sequence of comprehensive workshops (in English and Spanish) designed to empower parent and family advocates with the tools, resources, and strategies to help advance the goals of GEAR UP in their communities. DREI is a series of post-conference workshops designed to help GEAR UP administrators, researchers, and evaluators enhance their knowledge, skills, and methodologies related to GEAR UP and college readiness.